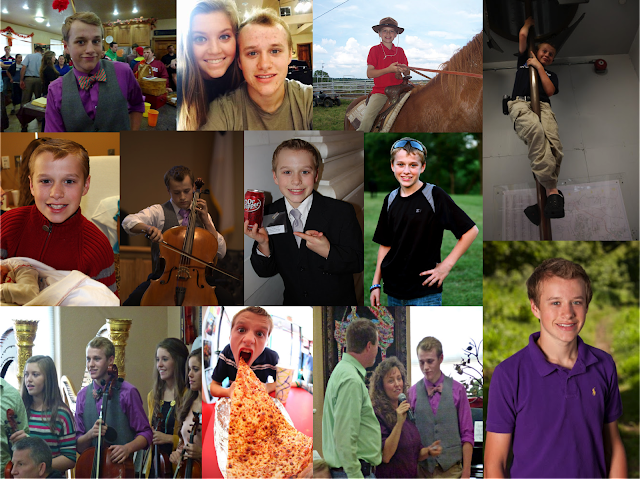 Wishing Josiah Duggar a blessed 19th birthday! Happy Birthday Josiah. Have a Great day. Happy birthday Josiah hope you enjoy the day. Happy birthday, Josiah! May God bless you always! Happy and blessed birthday Josiah!!! Happy Birthday Josiah!! Have a Blessed one! Happy Birthday Josiah ! May you know health, happiness and many Heaven sent blessings in the New Year to come ! God Bless ! Happy Birthday Josiah! May the Lord bless you on your birthday! Happy Birthday Miss you !!! Happy Birthday Josiah! Hope you have a blessed 19th year!! Happy 19th birthday Josiah! May God grant you many more years of health and happiness. Have a wonderful day with your family and friends. Happy birthday Josiah! Have a great day in the Lord! Happy Birthday Josiah !! God Bless You Many More. Have a great day. may you have bless day w family & friends! happy birthday ! joisah! Wow! 19! Where has the time gone? Happy Birthday Josiah!!!!! Happy Birthday Josiah. Hope you have a most wonderful and blessed day. Wishing you much joy to you and your family today and always, Josiah! Your testimony through the good and the hard times is encouraging so many believers who wait for His glorious appearing. So Josiah, "...let us run with endurance the race that is set before us, fixing our eyes on Jesus, the author and perfecter of faith, who for the joy set before Him endured the cross, despising the shame, and has sat down at the right hand of the throne of God. For consider Him who has endured such hostility by sinners against Himself, so that you will not grow weary and lose heart." (Hebrews 12) YOU ARE GREATLY LOVED! I hope Si got a chance to speak with Zack Bates about courtships that don't lead to marriage, especially since Whitney us so great. HAPPY birthday Josiah, God bless you! Happy Birthday! May God bless and watch over you and your family during the difficult times. A very happy birthday to Josiah! I have loved all of the Duggars but I think Josiah is my favorite because he has always reminded me so much of my own son. He's so funny and witty, always joking around or pulling a good-natured prank. I've always enjoyed his antics and facial expressions as shown in these great photos! I'll never forget the time he pretended to drop Jordyn Grace right in front of the cameraman but it was really a doll wrapped up in a blanket! And I remember the cool pinata he once made for a birthday celebration for Michelle. Love the look on his face in the one where he's eating the huge piece of pizza! Josiah was a terrific little kid and seems to have grown into an amazing young man. I wish him nothing but the best always! Happy 19th birthday Josiah!! May you have a wonderful day. Happy Birthday Josiah. Hope you have a very blessed day. I hope he has a wonderful birthday. He is so blessed to live with a family who loves him unconditionally. Wishing him a Happy Birthday! They grow so fast! Happy birthday Josiah!! He's definitely my favourite of the older boys! Happy Birthday!!! Wow, I can't believe everyone's growing up so fast! Happy Wishes to Josiah,,,,,,,,my favorite Duggar kid,,,,,,Great to watch him grow up on TV! Hope Josiah is having a great day today. I believe his favorite birthday is having Pizza but I could be wrong. Hope the rest of the family is well. Praying for Josh & Anna. My eyes are on Jessa right now. Have a happy birthday Josiah. You've up to be such a handsome young man. Happy Birthday, Josiah! May our Lord bless you and continue to lead you on His path designed for you. Happy Birthday Josiah, you are a wonderful Man of God! Have an Awesome day and a Blessed Year. Happy birthday. I hope you have an awesome day! Happy birthday Josiah!!!! Have a wonderful day. Happy Birthday Josiah...hope you have a wonderful day! Happy Birthday to a fine young man! Miss not seeing this program, I had been watching for years. now that Channel has nothing good on it. Wishing you a HAPPY BIRTHDAY JOSIAH !!!! Josiah have a day full of everything good. HAPPY BIRTHDAY!!!!!!! May God continue to lead, guide and direct your path according to His perfect will for youir life, He has a plan just for you!!! Happy, happy birthday Josiah! Make this year the best ever! Happy birthday, Josiah! GOS bless you! Happy birthday Josiah! God bless you! Happy Birthday, Josiah!! May you have many, many more! What a wonderful tribute. Loved seeing portions of Josiah's life. Happy Birthday young man. Happy Birthday Josiah! God bless you and keep you in His love and care. when i first started watching the duggars....josiah was a little guy, with the funniest personality and they used him alot to do the "teasers" he was one of the first i had "memorized", lol. happy birthday josiah!!! Happy Birthday!! Wishing you God's blessings in Jesus Christ! Happy birthday, Josiah! God bless you. Happy Birthday Josiah! Praying God's richest blessings on you! Happy Birthday Josiah! May God bless you today and may He smile on you throughout the coming years! Wishing you a birthday filled with love,joy and happiness. Have a great year. God Bless. Happy birthday Josiah! Have a blessed day! Happy 19th Birhday Josiah Hope you had a good one. Happy birthday, Josiah!!! May you have a fantastic birthday and may you have many blessings! I hope the focus is only on you for your special day as you certainly deserve all the love and many blessing. All the best and our prayers are always with you. HAPPY BIRTHDAY JOSIAH!! I so miss watching how the Duggars celebrate each child's birthday. Hope Josiah has a great day and I can't believe he is 19 - wow. I remember when he played the trick on the camera guy with the fake baby -so funny! God Bless Josiah! I do not know where to post this type of question so I am going to leave it here. Can you guys please update us on the younger girls? We miss seeing Josie and Jordan's interviews that they would do during the show! They were soooo cute and we would love to see more of the younger kids on this blog. Thanks! Happy Birthday Josiah and God Bless you many more too come. Happy birthday Josiah! May it be overflowing with the dear Lord's sweetest blessings. Have a great day! God bless! HAPPPPPPY BIRTHDAY JOSIAH!!!!!!!!! IVE WATCHED YOU GROW UP INTO SUCH A HANDSOME YOUNG MAN!! I HOPE YOUR SPECIAL DAY IS A BLESSED ONE WITH ALL OF YOUR FAMILY!!!!! GOD BLESS EACH AND EVERY ONE OF YOU!!!! I LOVE AND MISS YOU ALL!!! HURRY AND COME BACK TO A NEW STATION...MAYBE THE STATION THAT HAS THE BATES FAMILY ON IT...I WATCH THEM ALSO....LOVE YOU ALL!!!!!! So what is Josiah up to these days? Is he working? Is he taking classes somewhere? Is he doing ministry stuff? Praying for your family during this trial of your faith. I know that the Lord will bring ALL forth as gold. He is so faithful. Anna hold on. Happy Blessed Birthday to you! May God continue to bless you this coming year. Happy 19th Birthday Josiah! Praying you are having a great Birthday with your sweet loving family! Happy Belated Birthday Josiah ~ May GOD Bless You Richly! Happy Birthday Josiah! May God bless you! My son's birthday is August 29th. Happy belated birthday Josiah. God bless you. Hope you had a great day and that the year ahead will be wonderful for you. You are a gifted young man. I'm late wishing you a happy birthday but may you be blessed with joy and peace. I hope you and your siblings are allowed to look at this blog on your birthday to see the good wishes and prayer being said for you by so many of us. Best wishes Josiah, may you embrace and be true to the person God created you to be. Happy Birthday Josiah! Hope your last year as a teen ROCKS! God Bless!